This is my testimony of how I became a Christian. Although I feel this site isn't about me, it's about God and witnessing for Him in these last days, most of you probably don't know much about me or how I was saved. Perhaps it might do somebody some good if I can relate how I was saved, and what God has done for me in my life. Thought I'd also put up a little picture of me, so you all know what I look like. I was born on the 25th of November, 1980. All members of my family are born again Christians, which is a great blessing and privilege, for I will never have to experience the anguish of the possibility of some of my family not being in heaven. I live in a town called Bangor, in Northern Ireland, about 10 miles south east of Belfast. Both my parents were saved at a young age. My sister, who is three years older than me, was saved at the age of three. I was brought along to Sunday School in my own assembly, Bethesda Gospel Hall, in Bangor, from a young age, and my mother also took time to teach us the Scriptures. From an early age I was aware of my need of salvation. While I don't remember doing anything particularly bad, I knew I was a sinner, and that as a result I could never be in heaven. I still remember my sister telling me at our hall stairs, that when Jesus came back, they would be taken to be with Him in heaven, and I would be left behind, and that troubled me. Although I was very young at the time, I can vaguely remember several occasions when the thought that the Lord may have already returned caused me to panic. One day, while I was colouring in pictures with my sister at the dining room table, she asked me if I wanted to be saved. I told her that I did, and she said that I should just pray to God and tell Him that I was sorry for my sins, and ask Him to save me. I don't particularly remember the words that I spoke, but after I prayed that prayer, I remember feeling completely different inside, and having a knowledge that God had saved me. I ran and told my mum what had happened, who was listening to what was going on in the kitchen. That was on the 14th of January, 1985. After several years of attending Sunday School and meetings, I had a desire to be baptised. I can't really explain why, only that I believe it must have been the Holy Spirit prompting me to do that. So mum and dad took me to Bangor swimming pool that day, but it was closed for maintenance work. My mum tells me that I said if I wasn't baptised before Jesus returned, that I was going to blame it on my parents, such was my urgency. There happened to be a baptism in my assembly that Sunday, and my dad was filling the tank with water in preparation of that. So we decided to go to Bethesda, and my father took me into the tank, and baptised me, with just my mum and sister present. That was when I was seven years old, on the 23rd of December, 1987. In my teens I started to drift away from God. I didn't get into bad company or do anything particularly bad, I just grew cold. I stopped attending meetings, and just attended the Sunday School. I started attending Campbell College after I left Rathmore Primary School, which I enjoyed immensely, but left before gaining any qualifications due to bullying pressures. So I stopped attending, and after I was officially allowed to leave, I contracted a serious skin disease, eczema, which spread all over my body. This was caused by Persil washing liquid, but what Persil meant for bad, God meant for good :). I didn't tell my parents what was happening too my skin, until my sister came down with the same problem, and by then it had spread up my legs, and I now had to wear bandages around my legs. I still attended Sunday School, but eventually had to stop as it spread to my chest, back, feet and hands. I didn't want to go to the Doctor, so instead I stayed in my bedroom for a whole year, while my parents made me meals and handed them through the door. Christmas and birthdays were spent in my bedroom in the company of my family at the door. I still find it hard to believe what I went through. But this illness had a profound effect on my life. I started to go on the internet and program my EvenMore Textviewer for the Amiga computer. I used this tool to witness to other people across the world, and also enjoyed visiting the various prophecy sites for news. My mother was also extremely ill at this time, and my dad wired up an intercom between our bedrooms, and we could talk to each other. My illness constrained me to turn to God, and I knew God was with me even in that bedroom. After a year, we were planning on moving house, as my mother is crippled with arthritis, and needed a bungalow. Thankfully around this time I was well enough to go out again (it took a long time to adjust to that). Although our house was on the market for a year before being sold (next door's sold in 2 weeks), God had His hand in everything. God provided us with a house on the Gransha Road overlooking the park. That was another miracle in itself. Eventually I got the courage to attend a Chinese doctor about the illness, which cleared up after around 12 months. I started attending the meetings again, as I missed them greatly. Eventually, through the encouragement of my friend Helen, I ended up in her dad's Sunday School class, studying to become a Sunday School teacher. And for a year I sat in his class, until some other ones in our assembly left under strange circumstances. This left us without two Sunday School teachers, just weeks before the season started again, and after a lot of prayer, I ended up taking one of the classes. I still enjoy taking the Sunday School class, and use my God-given appreciation for art to help illustrate the lessons. Around 1999, a man called Roy Thompson, who was then in our assembly, was praying that I would get a job. Remember, I have no qualifications apart from passing the 11+ test. One day Billy Neill, Roy and a few others were travelling up to meetings in Belfast, and we happened to be talking about jobs, and what we would like to do if we had a job. I said I wouldn't mind working on computers for a job. But I thought nothing more about that. A few days later, my uncle Desi Brown came to visit us. He asked me what sort of job I would like to do when I grew up, and I told him the same thing. Out of the blue, he said the firm he worked for (Discount Window Systems) was looking for an IT Technician, and if I would be interested. I said I would be, and he said he would speak to the boss, Kieran Beattie. Kieran gave Desi a list of things I would be required to know about the computer system. I told Desi I didn't know any of these things, but I believed that if God wanted me to be in that job, He would make a way. On Friday, Desi called again, and said if I would like to go for an interview the next day! So I got together some of the work I had done, including magazine reviews of EvenMore, and we headed down to Belfast. Kieran interviewed me, and everything seemed to go really well. He asked me after we finished talking, if I would like to start on Monday, and I said yes! God is good. That was on December 13th, 1999, and I am still working there. 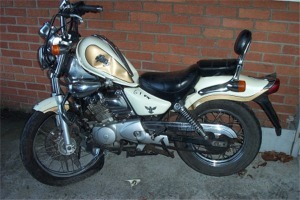 A few years later, through my other uncle Desi Fisher, I bought a little 125cc motorbike. I enjoyed using that to go to meetings and travel around Bangor. In the UK, you do not need a full licence to ride a motorbike, and so it is handy for getting about while you are ready to go for the driving test. For around 5 years, I used to get the bus into Belfast to work, which I enjoyed doing, although it was an hour and a half journey. But our company moved premises a number of years ago, and I couldn't find a bus to where my company was now based. So I started travelling by motorbike. I found the motorbike handy, for an hour and a half journey was reduced to half an hour, and I was now spending £5 a week on petrol, whereas before the bus costs £20 a week. Six months of travelling to work via the motorbike passed. On the 6th of January 2004, I slept in late. So I got up and got ready as quickly as I could, and jumped on the motorbike to go to work. As I was travelling down the carriage way, just about 5 minutes away from work, I was praying that I might make it around a particularly dangerous roundabout, where I had before nearly slipped off the bike in the rain. I was heading up the slip road around 60mph towards the bridge leading into the Holywood Exchange. The two lanes to my right, leading into Belfast, were completely jammed. As I started to slow down to take the turning onto the bridge, I saw a car suddenly appear cutting across my lane into a road on my left just before the bridge. It turned out that the two lanes on my right had stopped to let a man across, and he had driven out without checking the third lane. I just had time to think about putting on the brakes when I hit the back passenger side of the car. I remember seeing the sky spinning round for around three seconds (which seemed like an eternity), and then suddenly getting up off the road in extreme pain. I don't remember coming off the bike, or hitting the ground. The man stopped his car and came over to see if I was alright. I felt something was wrong with my groin area and my left elbow. A number of other people stopped their cars to see if I was alright, and one kind person let me use her mobile to call work and home. As I was phoning home, an ambulance came blaring down my lane. They checked me out, and asked if I wanted to go to hospital. I told them I didn't know, as I had never been in an accident before. But they decided to take me up to the Ulster hospital. I was wheeled into the hospital in a wheel chair, with full leathers still on! After they had checked me out in A&E to make sure I was OK, they wheeled me down to X-Ray, where I met up with my parents. I sat in the wheelchair waiting, and waiting, and started to feel very faint. This was just the effects of shock, but I called out that I was going to faint, and they miraculously found a bed for me, and wheeled me into a small cubicle, where they would do an internal scan. The Doctor's spent about 15 minutes just trying to figure out how to turn the ultrasound machine on, which was very funny, considering my job as an IT Technician. They also linked me up to a drip. They were scanning for internal bleeding, but they found none. Even my leathers weren't scratched, although I had burst blood vessels in my inside legs, and obtained several cuts and bruises on my arms and legs. While I was lying in my hospital bed in a tiny cubicle, I was contemplating whether this was my last day on earth. I was absolutely terrified by that thought. My grandmother had died just a few months before, and Helen's dad had died a week later, and I was wondering if it was now my turn. But I thank and praise God that He had other plans. After they were convinced I had no internal injuries, another miracle, they wheeled me down to X-Ray again, where they found a slight chip in my left elbow. Not a bone of him shall be broken! Amen. But my heart rate was 120, and refused to come down, even after around three pints of plasma was pumped into me. So they decided to keep me overnight, and I was devastated. But God helped me through that time, and was with me. It was an extremely trying, soul searching experience, and helped me realize just how fragile my life is. It also helped me realize that the most important things in life are those things that are eternal. When I took my bike to a motorbike shop to evaluate the damage for the insurance, they refused to evaluate it because it would be cheaper to buy a new bike (my bike was insured for £1800). The bike was so badly damaged, even the frame was bent. They asked who came off that bike, and when I told them I did, they were shocked when I told them that the only injuries I received was a fractured elbow. So that's where I am, and where I have come from. Friend, if you aren't saved, you won't be in heaven. Jesus said to Nicodemus, an extremely religious man, Ye must be born again. The events around us prove what the Bible has foretold will shortly come to pass, possibly within months if not years. The time is now to give your life to Him. He created you, He gave His Son to die for you on the cross. He wants to help you in your life, as He has done with me. Trust Him today, He will not turn you away.